← Zum Müttertag, zum Muttertag! 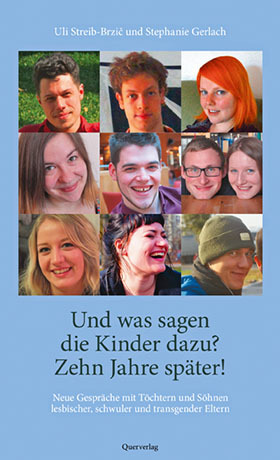 Gastbeitrag von Barbara für den von Dana Rudolph vor 12 Jahren ins Leben gerufenen Blogging for LGBTQ Families Day, der Internationalität wegen in englischer Sprache. The head of Germany’s rightist party is a lesbian mom. It bothers me. It bothers me a lot. I wouldn’t like it if she was „just“ a lesbian but it wouldn’t bother me as much. I know being gay doesn’t automatically make us good people, I know there are outright assholes that are LGBT. But a lesbian mom who’s overtly racist? Who’s representing a party that hates refugees, muslims and, yes, gays? I’ve been defending the LGBT parenting community against accusations of being apolitical, of retiring to suburbia, of giving up on our dream of a different society. I have been doing more grassroots awareness raising in the years that I’ve been parenting than in the many years of political involvement before, just by being out wherever we go. And as parents we go lots of places that are central to our society. I’ve also maintained that LGBT parents are a personally great segment of our community: If I think of the many hundreds of people I’ve met in that context, the amount of intelligence, kindness and political sincerity has been way above average. Yes, I’ve learnt that identity politics are very problematic; you have to always look at power dynamics and intersectionality. But sometimes I can’t help myself and LGBT parents feel like my people. Which makes this rotten egg hard to take and a personal insult. On a cheerier note: The other day our teenage daughter found a small pile of clothes in the basement, clothes from my student days. Some t-shirts that remind me of places I’ve been, some t-shirts that remind me of struggles still not won, pants that remind me that I once fit in them! I kept them partly so that there could be such discoveries one day but my hope was dim that they would actually generate much interest. Rewind to three weeks ago: Our daughter comes up from the basement with said pile on her hands and a big smile on her face. „Why did you never tell me these treasures were there?“, she asked. „These are exactly the clothes you can find in stores today – except these are real.“ And she started to don them, one after the other. One day she wore Emma Goldman to school („If I can’t dance, I don’t want to be part of this revolution“), the next day two women kissing („Read my lips“), and she did not care what anybody said or thought. She was happy. Practically glowing. And so was I. Who would have thought that our top-model-watching, artificial-nails-sporting teenager would wear our old fighting garb with such pride? What connects these two stories? I guess they’re both musings about belonging. And about values. Both of which are fitting issues for Blogging for LGBTQ Family Day, aren’t they? 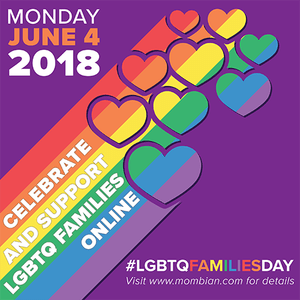 2 Antworten auf "Blogging for LGBTQ Families Day"
In the US, there is a former athlete who came out as trans and transitioned. She supports Trump. I just can’t wrap my mind around it. I think it is amazing that your daughter loves your old clothes. Sounds perfect!